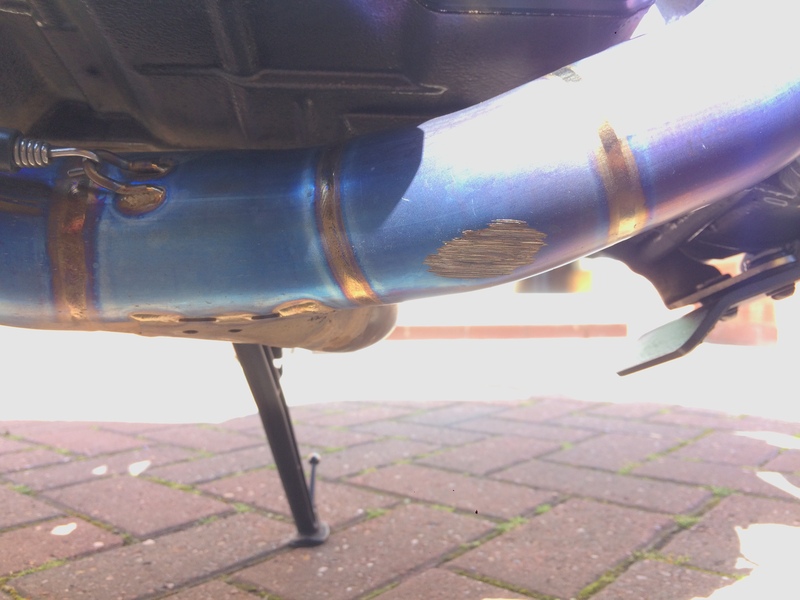 Noticed when cleaning that I’ve scraped my exhaust header on the right hand side. I’ve got PP rear sets and the full Akra system. Has anyone had a problem with this before? Back on a bike after 18 years and what a bike! IMHO, I doubt you scraped that by leaning. I mean, is it possible you rode off a curb, pulled up too close to a curb or parking divider or something of the sort? Leaning the bike, there are many other ‘hard parts’ that would scrape before your Akra header did. Also, I’m no forensic analyst, but the angle of the scrape doesn’t seem like it would come from the ground. I have seen this issue posted somewhere else where the bike had major scraping when used on a track. So must be due to incorrect suspension. I’ve had both bikes leaned over all the way at the track and there’s plenty of ground clearance with proper springs rates for one’s weight. Thanks for the replies. I’ve added a turn of preload on the rear, obviously I can’t do that on the front. I’m an average weight so can’t imagine front and rear springs would be too soft.I’ve copied the suspension settings M Rutter used in his Superduke test in Performance Bike magazine. Seems ok. Seems better. Think I’ll etch an outline around the scrape, that way I’ll know if I add to it.